What a glorious day it was today in Margate! 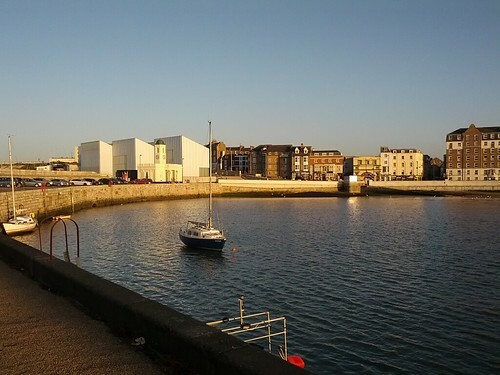 This week being half term, I have several visitors coming "Down to Margate (you can keep the Costa Brava...)" Fortunately it is starting off as a week of beautiful sunshine in which the old town and the harbour are at their best. Visitors quite understandably like to experience the excellent Ambrette with its well-deserved Michelin star so I am being spoilt. The above photo was taken from the Harbour Arm just after ten to four, so about half an hour before sunset now that we are back to proper organic, natural, eco-friendly, astronomically correct, Greenwich Mean Time. (What exactly is the point of British Summer Time?) No messing with this photo: the rich afternoon colour is just as the mobile phone camera picked it up.